Specific. Caring. Consistent Training for your dog... and you. Learn to control your dog. Located in Newbury Park, CA All Purpose Dog Training LLC provides personalized high quality training for you and your dog. Our Dog Training Programs are designed to be specific, consistent, and caring. 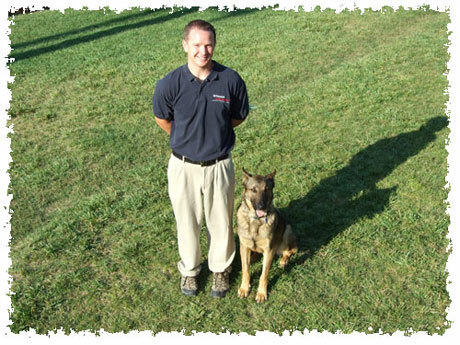 Managed by veteran dog trainer Nick Koep your dog will learn to understand and follow commands. Since 2005 Nick has become sought after for his effective training style. Based upon the needs of your dog and your personal desires a program specific to your situation will be developed. Our experience training family dogs in basic skills and obedience combined with our experience training professional dogs for public demonstration, drug and bomb detection, and guard duties has proved a simple point; consistency gets results. All our work with your dog will be consistent to the specific goals of the program. We genuinely care for the quality of our work and the well being of your dog. The training will be administered in a caring manner. In the 3 week program, for example, your dog will live freely within our master trainer’s home around his family and children; this program creates truly amazing transformations in dog behaviors. Dog Trainer in the Los Angeles and Ventura County areas. From puppy training to potty training and everything in between we have the experience and ability to make a difference in your dog. Serving customers throughout Southern California including: Simi Valley, Moorpark, Thousand Oaks, Westlake Village, Oak Park, Lake Sherwood, Newbury Park, Camarillo, Woodland Hills, West Hills, Porter Ranch, and surrounding areas.